Turmeric is an effective remedy for colds and throat irritations. 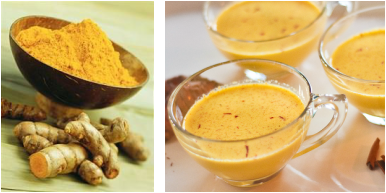 Half a teaspoon of fresh turmeric powder mixed in 30 ml of warm milk, and taken once or twice daily, is a useful prescription for these conditions. Turmeric powder should be put into a hot ladle. Milk should then be poured in it and boiled over a slow fire. This mixture should then be drunk by the patient In case of a running cold, smoke from the burning turmeric should be inhaled. It will increase the discharge from the nose and provide quick relief. 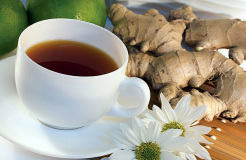 Ginger is another excellent remedy for colds and coughs. About ten grams of ginger should be cut into small pieces and boiled in a cup of water. It should then be strained and half a teaspoon of sugar added to it This decoction should be drunk when hot Ginger tea, prepared by adding a few pieces of ginger into boiled water before adding the tea leaves, is also an effective remedy for colds and for fevers resulting from cold. It may be taken twice daily. The roots of the bitter gourd plant are used in folk medicine to cure a cold. A teaspoon of the root paste, mixed with an equal quantity of honey, given once every night for a month, acts as an excellent medicine for colds. 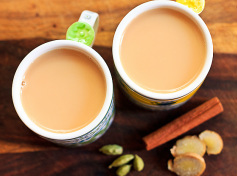 At the onset of a cold, add 1/2 teaspoon each of cinnamon and ginger to 1 cup of scalded milk. Add 1 tablespoon of honey and drink while hot. Very soothing and stimulating.